Enjoy this amazing series of short scenic hikes and photo stops through the Valley of Fire. Your professional guide and driver will pick you up in the morning from your Hotel or meeting location in Las Vegas with plenty of snacks and cold bottled water. Your guide will also share many facts on the History, geology, desert plants and wildlife along the journey. Meet your guide for pickup from your Las Vegas hotel or other central Las Vegas pickup location. 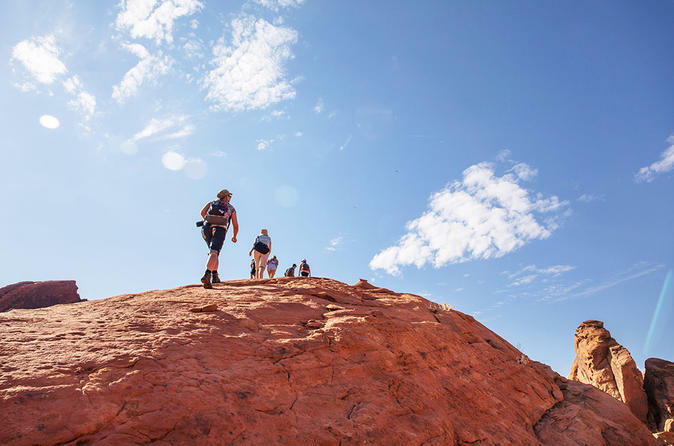 Then travel with your guide to the park to enjoy the best of the Valley of Fire with a guided half-day hike through the park's most stunning locations. Your first journey is White Dome Loop a 1.1-mile moderate hike with a beautiful slot canyon and amazing rock formations. Moving on to Mouses Tank Canyon a 1/2 mile easy hike with many ancient Indian petroglyphs and more colorful rock formations. Your third stop is the Visitor center where you may enjoy the many geological and wildlife exhibits plus a great gift shop. From here your Guide will take you to a scenic picnic area for a delicious lunch with plenty cold bottled water and snacks. After lunch, you'll make a few short photos stops then back to your hotel. This tour is approximately 5 hours, exploring some of the areas most scenic viewpoints and locations with the viewing of ancient Petroglyphs, a wonderland of colorful rock formations and time at the visitor center. A picnic lunch, snacks and plenty of cold bottled water are included. This is an easy to moderate hike for most ages in relatively good shape. Due to uneven surfaces, this tour is not recommended for those with walking disabilities or using a wheelchair.